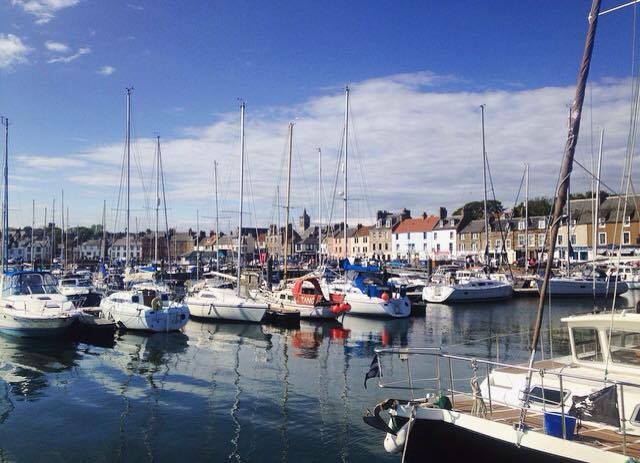 Slightly further along the coast from St. Andrews is the lovely little fishing village Anstruther. Famous for it's array of fish and chip shops - most notably the Anstruther Fish Bar which has been named Scotland's best fish and Chip shop many times it makes the perfect day trip from St. Andrews as it is only a short 20 minute bus ride away. With it's little winding streets and various small gallery shops it is the epitome of a quaint fishing village. Of course the main drawing point for us was the food at the fish bar and it did not disappoint! I would definitely recommend sitting in rather than taking away as the takeaway queue was right out the door, however we breezed past and got a lovely little table with traditional benches. All meals included chips (of course), bread and butter perfect for making the essential 'chip buttie' and a mug of a hot drink of your choice. With such a build up of accolades it's safe to say my expectations were pretty high and it definitely did not disappoint! Honestly, it was the best fish and chips I have ever had and that is saying something! After our dinner we went for a walk along the harbour and sat on the edge of the pier, from which you can look across to the Isle of May which is definitely on the to do list for once I come back after my year abroad. Although we may have disrupted a very peaceful fishing trip with our giggling it was lovely to just watch the sea ripple and soak up some of the very rare but beautiful Scottish sun. It was such a lovely day out and I will definitely be back! Have you ever visited any of the villages on the fife coast? Let me know in the comments!